Our 2012 Collection of Star Wars Party Food & Crafts! 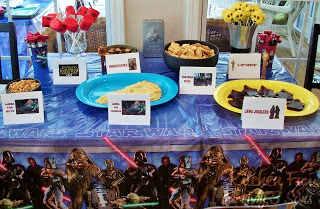 We have finally gathered up all of our Star Wars party food into one post and we are so happy to share this years party ideas with all of you! We tried to make everything unique and original. 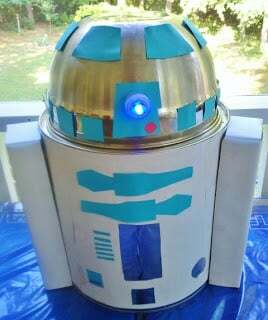 We also wanted to switch things up from last years Star Wars party. The picture above is one of our tables from my 6 year olds party. 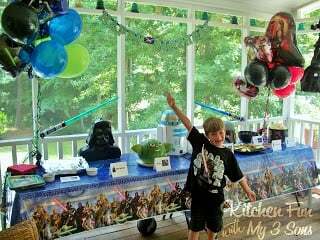 He is the biggest Star Wars fan and just loved all of it! We shared our Planet Hoth Wampa Cake last week and you can get the how tos and other pictures for that here…. Here is my 6 year old birthday boy about to blow out his candle! This is our Yodamelon and the kids LOVED this! This would also be great to make for a summer time treat for the kids other than for a party. 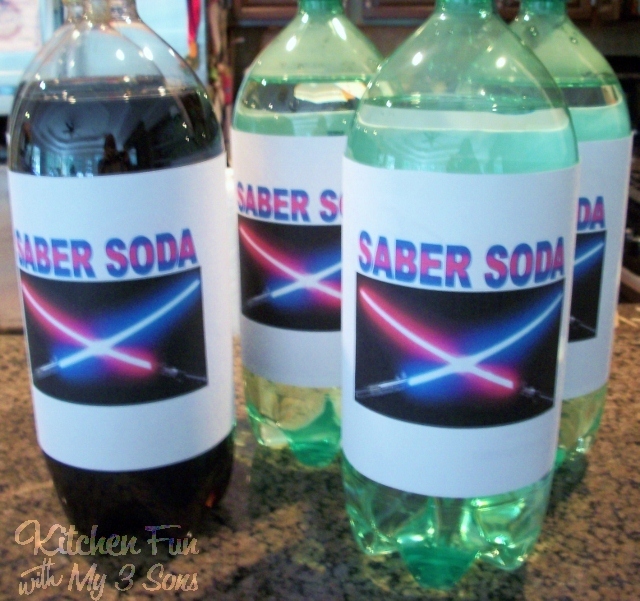 Very easy to make and you can get the how tos here…. We made this R2D2 craft by covering a Tinker Toys can with white paper. We flipped over a silver bowl and put that on top. We decorated with construction paper and foil. The arms are from a priority mail box. 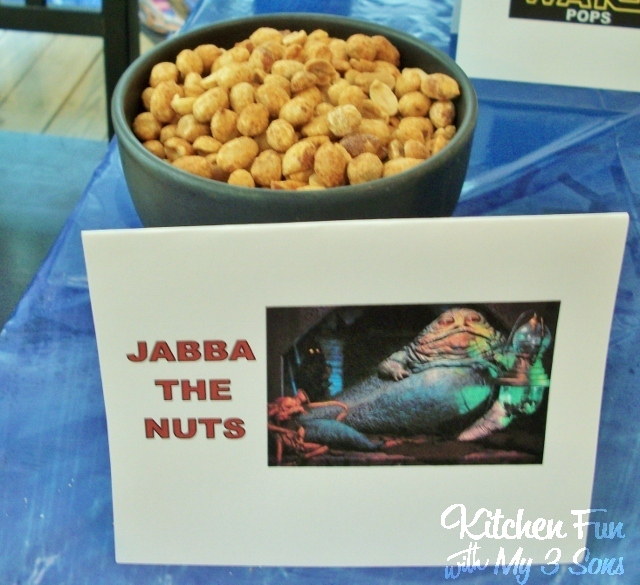 My husband had these little blue lights that we taped on the bowl…turned out pretty cool! We do not eat beef for pork so we eat a lot of Morning Star and Boca soy products. 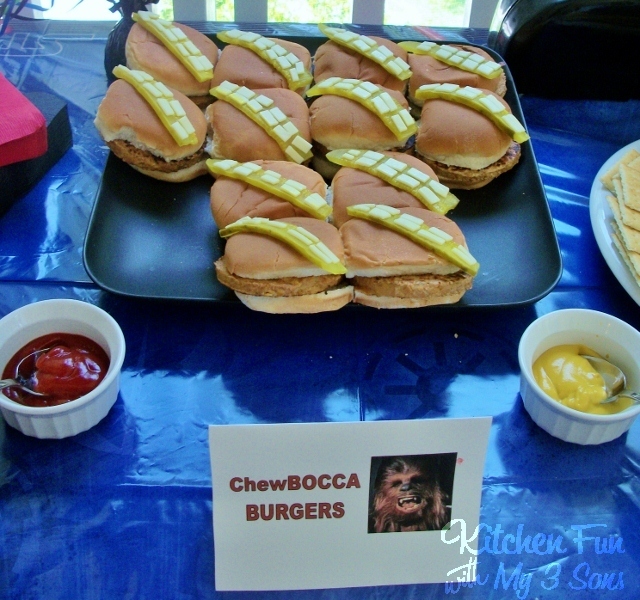 We thought it would be cute to make ChewBOCCA Burgers instead of Chewbacca. Get it!hehe All I could think to do on this one is to make his strap and put that on top of the burgers. I just didn’t have time to make his face. This was made by cutting dill pickle slices in half and topping with little provolone cheese squares. You can premake this several days ahead and keep in the fridge. Just stack 2 pieces of cheese and cut into slices..then cut to make squares. Takes a few minutes! We grilled the burgers a few minutes before the party started. There were lots of kids that had never had a soy burger before and loved them! Kids always love C-3PO so we wanted to make sure to make him out of something. 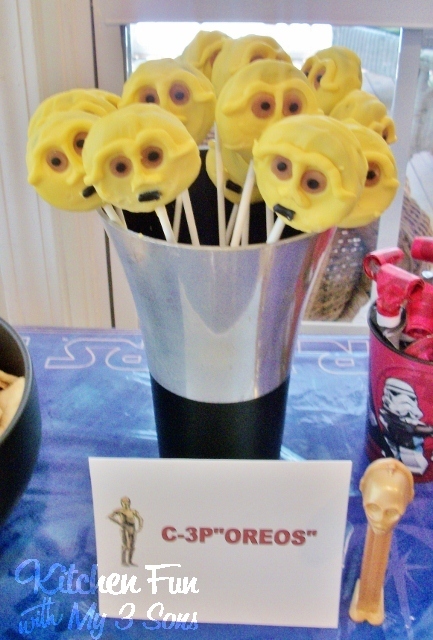 We decided on Oreo cookie pops and called them C-3P”Oreos”. My brother Brian helped me think up this one. bunch of 6 year olds really care! That is a idea for you though! 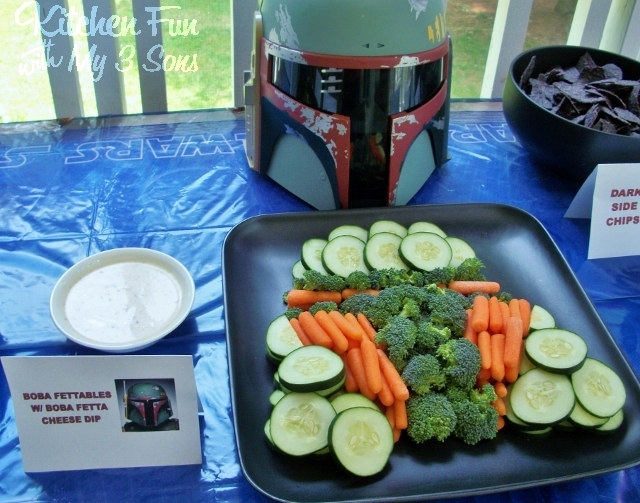 I always insist that we serve some veggies at a party so we made Bobba Fett out of vegetables and called them Bobafettables! 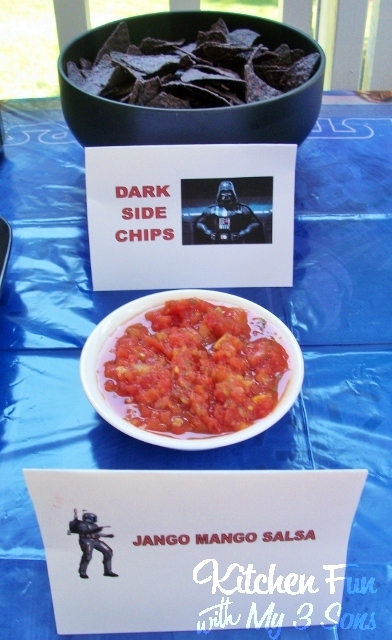 We served with Boba Fetta Cheese Dip..hehe! 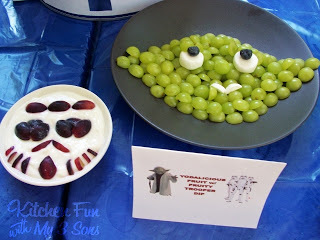 grapes and a Storm Trooper out of Fruit Dip. We made fruit dip and just decorated it with dark grapes cut in half. 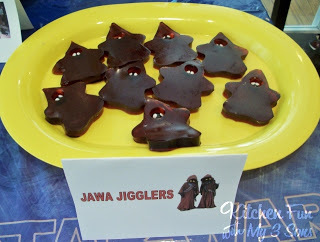 We came up with these Jawa Jigglers & they were so good! We wanted to throw in some super easy things to save on some time. We put Teddy Grahams in a bowl and called them Ewokookies. 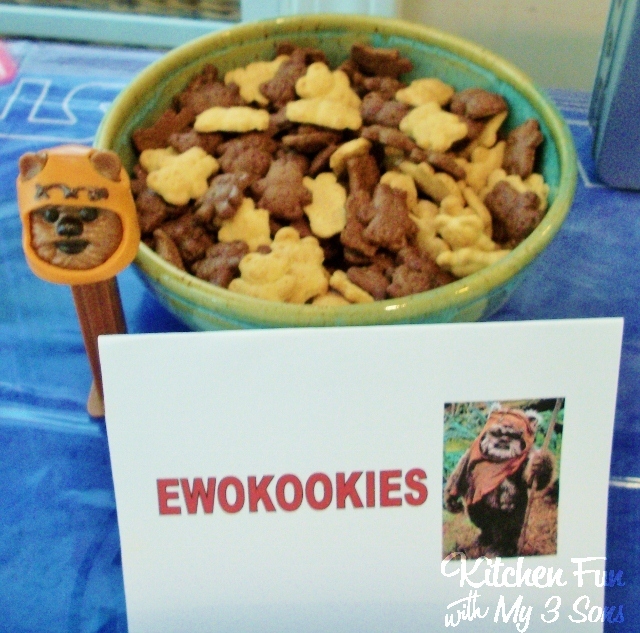 They do look like little Ewoks and the little kids loved them! We changed up our drinks this year and had Luke Skywater…. We had Darth Vader masks for the kids…. Here is my happy little 6 year old Jedi Master headed into his jumpy. 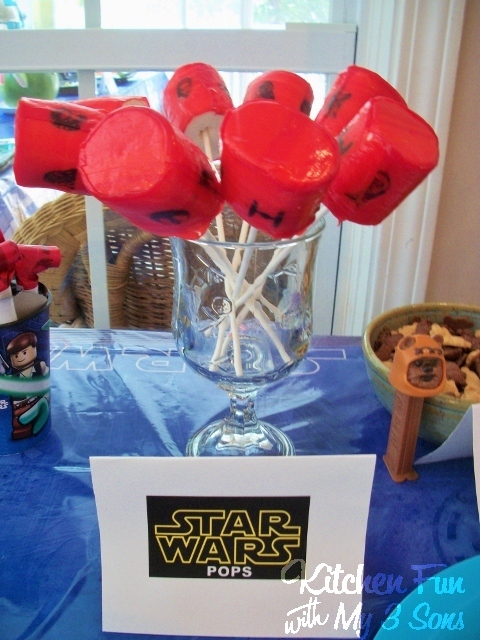 We hope that you liked our Star Wars party ideas from this year! Make sure to check out our Star Wars party from last year here. Including…Chewy Wookiee Cookies, Garbage Masher Cake, Sweet & Salty Sabers, Little Leia Cakes, Storm Troopops, Han Solo Rolos, Yodamole with Trooper Scoopers, Leia Buns, Storm Trooper Cheese Ball, Falcon Ship Dip, Jar Jar Links in a Blanket, Vader Taters, & Saber Sickles! wow jill! 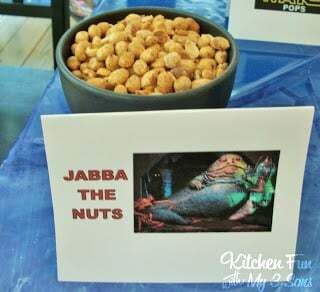 you did awesome…i love them all, but jabba the nuts really gave me a chuckle! we did star wars themed party last year and it's fun coming up with all the stuff, right?! again great job! Thanks! 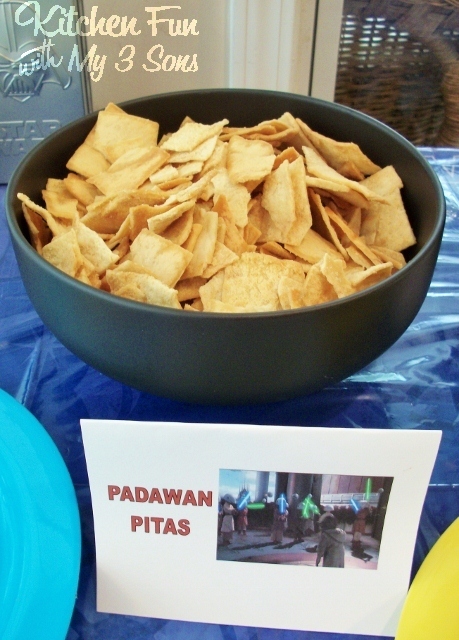 I love coming up with Star Wars party food..so many fun characters! Sugarswings…I am still in love with your Wampa cupcakes…adorable! Tara…cute stuff! Looks like such a fun party!! 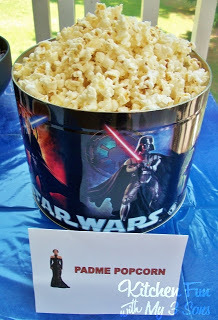 We just had a Star Wars party too. I love all of your fun food ideas – especially those yoda grapes! Holy heck! That looks like a lot of work. Love the planet hoth cake. Okay, I love everything. You are a creative genius! Thanks…it really wasn't that bad. Everything can be made 2-3 days ahead. We had the party on Sunday afternoon and I saved Saturday to focus on the cake. 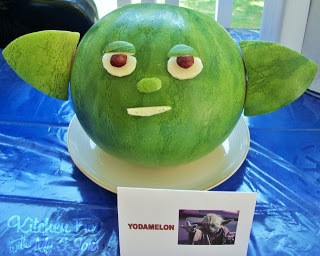 I made the yodamelon and a couple other things the day of the party. Seriously!?! How stinking cute are you guys.. and my boys would go CRAZY for this party.. simply amazing! What a fabulous party!! 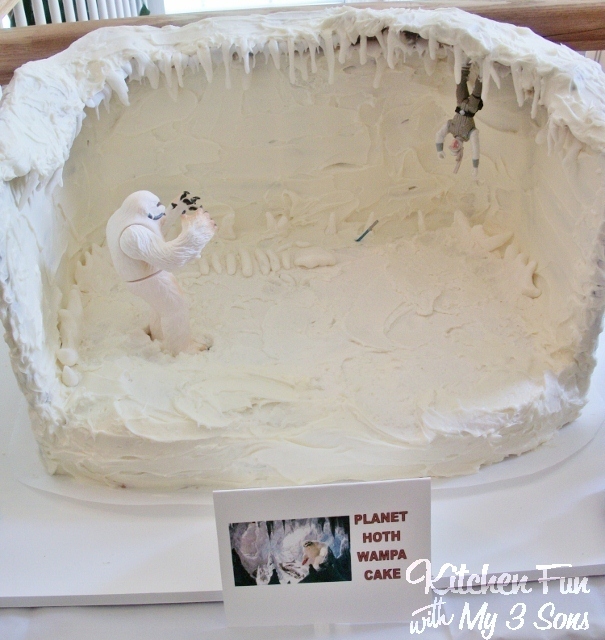 Of course, the cake is my favorite part. :0) You are always full of so many creative ideas, how do you do it? This is great! Love the JAWA Juice Funny! 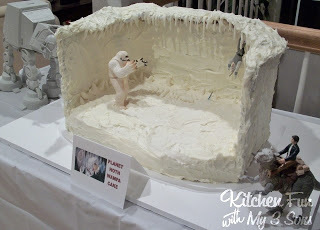 Awesome cake too!! I LOVE this party. You did an amazing job! 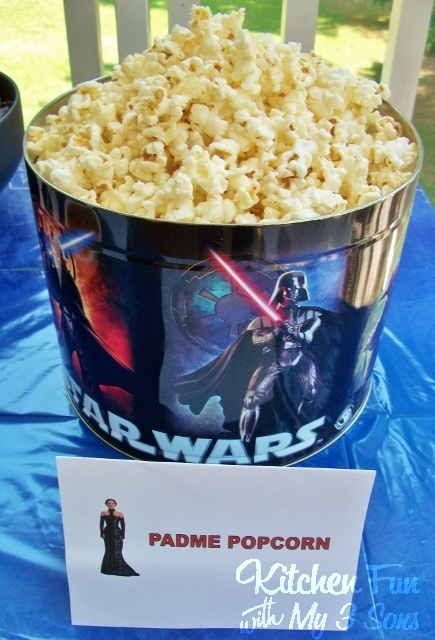 I want you to throw ME a Star Wars party! This really is the coolest I've ever seen! 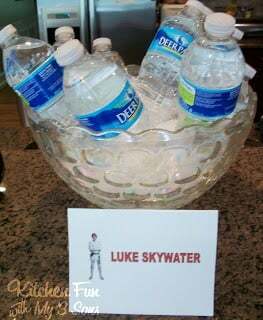 You're so creative!!! What a cute theme party! What a strange comp, great idea though. Thanks. 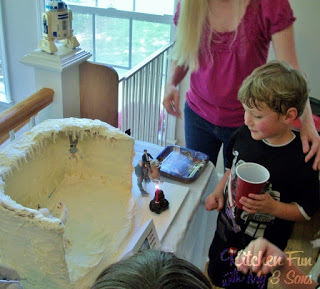 My kids would have LOVED this party! Pinning of course! Thanks so much for sharing at Mom On Timeout! 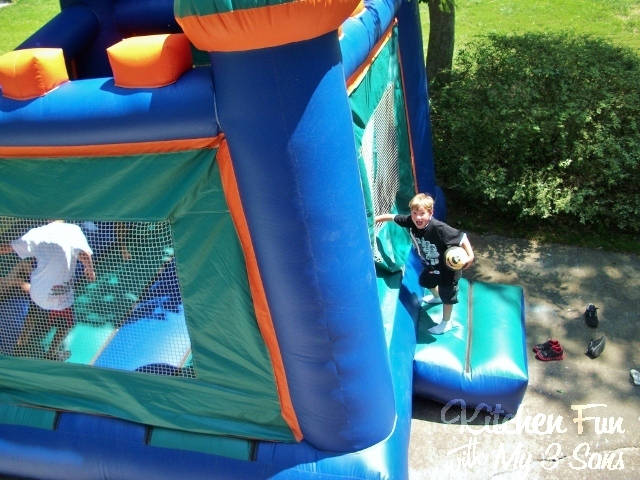 Amazing fun for families with stay at home moms, and highly expendable income! 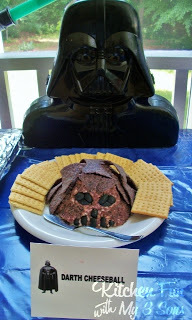 This is the most original food I've seen and I've been searching for days!!! 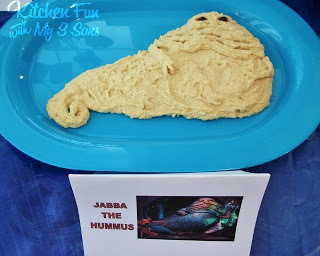 Jabba the Hummus made me LOL and almost wake up my family. 🙂 FUN ideas! I love your ideas. 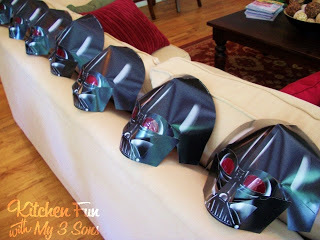 I am taking some of your ideas and turning them into a Star Wars Date Night for me and my husband! 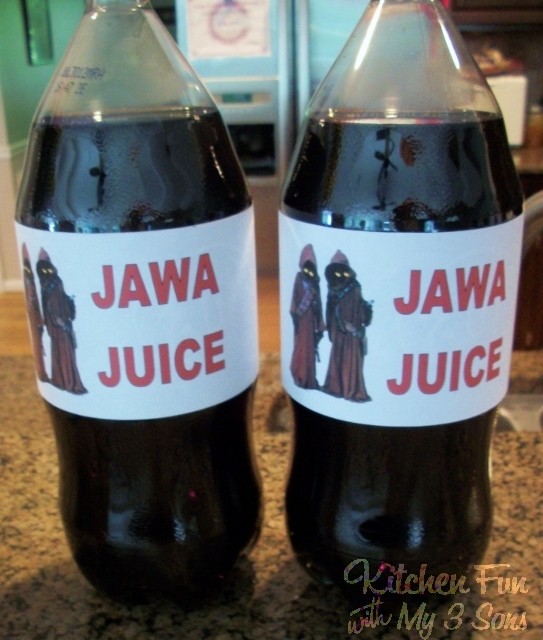 Since Disney bought Lucas films I have been trying to get into Star Wars. I am going to be linking back to you on my blog! 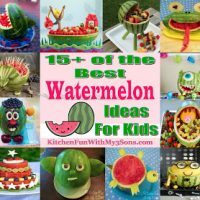 Such awesome ideas and healthy ones too! 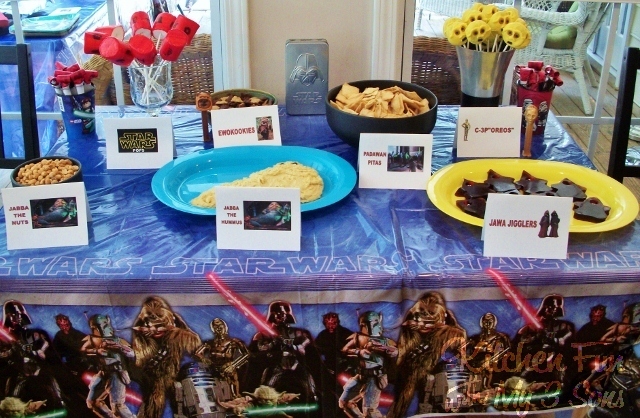 This is the best star wars party I saw. The designs were creative and the name were humorous such as the jabba the nuts, and c3poreas. OMG! Awesome ideas! 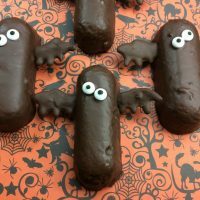 🙂 I was looking for the best fun snacks for kids, but these are not just easy to prepare, they look super adorable. Very nice site! 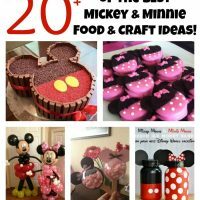 Those ideas are really amazing for kids party ideas, I really loved the pictures too.